Instead of making you wade through 10,000 words to get the program details you’re going to see high-impact videos, showing every single workout of the program. These workouts were real, not staged or rehearsed. We used experienced bodybuilders as subjects, and I pushed them to their limits on every set. They’re extremely fast-paced, and provide tons of information that you just can’t see in person or deliver with the written word. Click here to go to the I, Bodybuilder Workout Videos. The I, Bodybuilder Program is designed for advanced level and elite lifters. This doesn’t mean that intermediate-level lifters can’t participate, because they can. In fact, I want to encourage anyone who’s serious, and who has enough lifting experience under his belt, to jump right in and get on the program. So you be the judge. You want it? Go for it. No hype, no exaggeration, pure and simple, build muscle as fast as humanly possible. More specifically, build muscle as fast as humanly possible — week after week — until you see a body in the mirror that you barely recognize. That’s radical hypertrophy, and that’s exactly what this program’s all about. I’ve trained dozens of lifters with these techniques, and every single person has been totally blown away. Bottom line, these principles work just exactly as promised. You have to perform each rep of every set, using a very specific rep style and associated techniques. To be able to do this, you have to clearly understand all of the workout parameters of the high-threshold hypertrophy methodology. The rep style is by far the most important parameter. And ultimately, you have to go into the gym, and perform each rep perfectly, as if your life depended upon it. If you want superhuman results, you have to train with superhuman intensity. And to do that, you have to utilize the Plazma™ Protocol. It’s true. The Plazma™ Protocol is a painstakingly researched, peri-workout dosing plan that’s designed to potentiate anabolic physiology to the point of superhuman responses when training at advanced levels. Depending upon your progress, and the areas of weaknesses you need to work on, each phase can last between 2 and 4 weeks. But it’s totally up to you when to move on to the next phase. Regardless of the areas you want to focus on, please follow the order of the phases. In other words, don’t skip a phase just because you don’t think you need to work on, let’s say, shoulders for example. Or don’t change the order of the phases to meet your specific priorities. We chose a body-part specialization approach because, if utilized in a comprehensive program, it’s one of the most-effective ways to make the largest overall gains. In other words, emphasizing one major body part at a time — without neglecting the rest of the body — will lead to the greatest overall gains by the end of 12 weeks. We know we’ve said this so many times, but the program works. We know it because we’ve tested it. So, just do what we ask, please, and don’t screw up the order. And we mean this in the nicest way. Really. Traditional warm-up sets are counterproductive, whereas feeler (practice) sets are highly productive and effective at ramping up the nervous system and associated target muscle group. 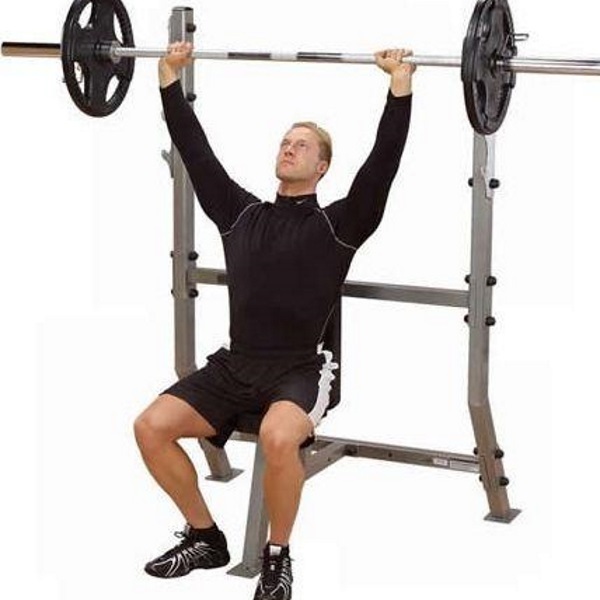 As a general guideline, on your first exercise of a workout, or on any exercise where you don’t feel adequately prepared for maximum effort, perform two feeler sets with 40% to 45% of your 1RM. Then go right into the working sets of the lift. Overall, you should keep the entire workout pace as brisk as possible without sacrificing rep quality and maximum performance. So, no matter what the suggested rest is on an exercise, understand that it’s simply a guideline. The actual objective is to rest the least amount of time required to be able to give a maximum effort on each rep of the upcoming set. If you actually timed the rest periods of our advanced lifters, they’d range between about 10 and 60 seconds on lighter sets, and 30 seconds to 120 seconds on heavier sets. On rare occasions, they might actually rest up to three minutes, but that’s not very often. Above all, never, ever look at a clock and count down time during rest periods. It totally kills workout intensity. A brisk, auto-regulated workout pace, in and of itself, is an activation technique. So use workout pace to further amp up the nervous system. Listen, maybe this whole thing seems too daunting or difficult; maybe it hurts your brain too much. After all, doing 3 sets of 8, like most ordinary gym rats have been doing since the dawn of time, doesn’t take any smarts. I’m asking you to push the envelope a little. Do a little homework. Really learn this program. An hour of investment up front, followed by a full training and supplementation effort, will give you the results you’ve been looking for ever since you first started lifting. Now, let’s see what you’re made of.